I vividly remember the way the bookstore employee warily looked over her glasses at me. Honey, you’re way too young for this book. Seventeen years old and holding a copy of She’s Come Undone in my hands, I gave the employee a stony glare back. What exactly is it you think you know about my life? She knew that she was an adult, and I was a young person. And that was all she needed to know. Woven into that employee’s warning to me was the belief that by virtue of my age, I couldn’t be trusted to know what was right or best for me. This is adultism – the power and privileging of adulthood over youth – defined. Adultism and ageism are often used interchangeably, but there’s a critical difference. Ageism is like a multipurpose tool that doesn’t necessarily have a specific use. It can be employed to wrench rights from the elderly, while also hammering constraints onto children. Adultism, on the other hand, names a focused system and its specific source of power. You might compare adultism to ageism as you would white supremacy to racism: by naming the dominant identity, we generate heightened awareness of and responsibility on behalf of the source of oppression. An essential ingredient in all recipes for social justice is self-determination: the ability to author your own life. To be the subject, rather than the object, of your life. And yet the denial of youths’ right to self-determine is as old as civilization itself. Literally. In 350 BCE, Aristotle stated that children were the property of their father because he had produced them, not unlike a tooth or a hair. Millennia later, adultism is one of the stealthiest players in modern society, built into the foundations of family, community, culture, and government. In 1946, children were formally recognized within the Declaration of the Rights of the Child. The minimum standards for those rights weren’t set until 1989, when the United Nations established the Convention on the Rights of the Child. These agreements are crucial for protecting youth from human rights violations. However, they don’t get at addressing adultism because the privileging of adulthood is entrenched within the policies themselves. How many of them do you suppose were co-authored by the young people they aim to protect? Essentially: Youth aren’t necessarily the subject of children’s rights. Historically, they’ve been the objects. You’ve heard it before: “Youth are the future.” If that’s true, why don’t we stand in deference to their expertise? We’re socialized to understand adultism as natural because of the supports we need as youth. It’s undeniable that adult guidance is emotionally, socially, and physiologically necessary. But it’s when adult power and privilege over enters the game that we get into adultism territory. Still unsure what this means? Let’s check out some of the most common ways adultism rears its head. First, the Institutional: It’s in Our Walls. As with other systems of oppression, adultism relies on institutional support to pump it into and throughout our lives. You can find it embedded in schools, social service systems, government, and culture. Schools adopt zero tolerance policies that push youth out of the classroom through suspension for minor infractions. Child welfare organizations place youth in inappropriate foster homes without their consent. Stop and frisk policies encourage law enforcement to profile youth as criminals. Legislation bars youth from the right to learn empowering information. Youth are denied the right to make medical decisions for themselves. Burned out staff in youth nonprofits devalue youth participants. Media depicts youth as violent, hypersexed, disrespectful, and disengaged. No, the individuals working within these institutions aren’t all bad. Nor are the intentions of the institutions themselves. The trouble is that they are built on the adultist assumption that a 14-year-old can’t inherently know their own developmental needs. Because of this, the 14-year-old’s right to self-determine within these institutions is often limited, if not entirely wiped out. In Addition to the Institutional, It’s the Individual: It’s in Our Words. Weaving through our subconscious, adultism seeps into our everyday interactions with youth. Pay close attention for an hour – anywhere – and you’ll hear it. It pops up not just between parent and child, but teacher and student, youth worker and program participant, store clerk and patron, youth and youth, adult and adult. Adultism is often neatly packaged in a microaggression: a subtle, everyday exchange that communicates to members of a marginalized group that they are undervalued and undesirable. Adultist microaggressions are so broadly accepted as normal that I can easily recall 1) being enraged as a youth hearing them; but 2) repeating them as an adult without thinking twice. How many of the following have you heard…in the last week? The consequences of adultism parallel its use: They’re institutional and individual. When our institutions are designed under adultism, they’re designed to fail youth. We create rigid programming that doesn’t honor the lived realities of youth, we use didactic education styles that don’t engage youth participation, and we create punitive structures that limit the capacity of youth to take genuine leadership. Individually, adultism leads to many of the consequences we associate with “being a teenager”: anxiety and depression, a sense of worthlessness, feeling alone, acting in or acting out to be heard, and the displacement of powerlessness onto peers (also known as bullying). And it hurts adults, too because — well — we never really get to know youth. As with other sources of oppression, adultism doesn’t act alone. Youth sit at the intersection of different oppressions that impact how adultism shows up in their lives. For example: Who gets followed around stores (if they’re even let in)? Youth. Specifically, LGBTQIA+ youth of color. Young girls enter a world where misogyny hypersexes and shames them. Trans and gender non-conforming youth have extraordinarily limited control over their bodies and genders. Ableism amplifies adultism, too. Every day, youth are over-diagnosed and medicated when they display age-appropriate behaviors. Standardized testing is inappropriately used to determine intellect. Youth’s bodies face inappropriate manipulation, such as in the case of youth with intersex conditions. Okay, I’m Part of the Big Adultist Machine — What Can I Do? 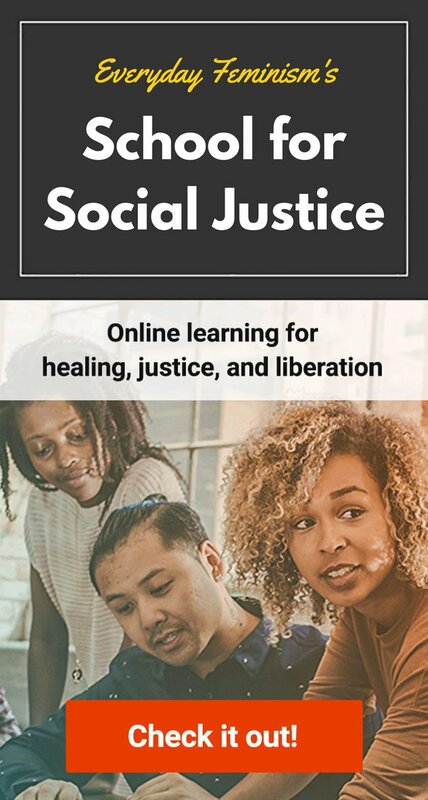 For adult readers, let’s go through some introductory steps you can take in your everyday life to examine your power and privilege and start the journey toward becoming an adult ally. For those who identify as youth, hopefully you can find some tools to further cultivate the skills of your allies. Before we go any further, I want to clarify that the need to dismantle adultism doesn’t mean that every interaction between an adult and youth is adultist. Youth development demands that adults play an important and vital role in cultivating young people’s ability to self-determine. For example, a five-year-old and a 14-year-old are both entitled to information around healthy sexuality that empowers them to take care of their bodies. However, the words used to deliver that information will differ between the two of them. Similarly, a three-year-old and a 17-year-old should have the ability to self-express. However, while a three-year-old will require some guidance selecting an outfit, a 17-year-old likely won’t. Youth are entitled to choice and ownership in their lives. But the tools with which adults support them will vary throughout their development. If the answer is no, consider why. When you interact with youth, do you find yourself filtering them through stereotypes? Is she just rebellious? Is he apathetic? Do they just not want to behave? Do you know better? Yes, you earned that degree. Yes, you have years of experience. Yes, you are in a position of authority. But our sole area of expertise as humans is in our own experience. And youth are the experts of their lives. Respect their insights as truth. Surrendering adult privilege enables youth to take genuine ownership over their lives. Would you select a different dating partner? Sure, but you’re not the one dating them. Might you structure that afterschool program differently? Sure, but the program isn’t for you. Would you select a different career or college? Maybe, but you’re not the one going. Honoring youth means valuing their time and contributions on a par with adults. Asking youth to build, conduct, or participate in programming? Provide them with meaningful compensation: pizza may be important if it’s dinnertime, but so might payment if they could otherwise be working. When “You’re not old enough” actually means “I am unsure how to tell you this,” the conversation is not off limits for youth! Whether it’s sexuality, racism, abuse, gender, or another “adults only” topic, locking youth out only serves to silence their very real experiences. Instead, find and use accessible language that empowers them to fully participate in sharing their lives with you. When you’re part of a dominant group, you become privy to allllll sorts of things that group members might not say in public. When you witness another adult engaging in adultism, say something! If you work or volunteer with youth, check out some tips on creating meaningful youth-adult partnerships by the National Foster Youth Advisory Council. For parents, the Common Action Center for Social Engagement has a list of resources for anti-adultist parenting. A shift that creates real space for youth to self-determine within all realms of life, regardless of whether or not their insights challenge the power and privilege of adults. Youth leadership has driven some of the most momentous social change in recent history. From the May Fourth protests of imperialism in 1919 (and 1989) by Chinese students, to the Student Nonviolent Coordinating Committee organizing of sit-ins and freedom rides in the 1960s American South, to the youth uprising against apartheid in Soweto, South Africa in 1976, to recent youth organizing for public education in Chile, to youth in North Africa and the Middle East continuing to organize across social media for government reform, youth are at the frontier of identifying injustice and uniting in solidarity to confront it. Today, youth continue to demand change – change that incorporates not only the dismantling of adultism, but one that incorporates all the intersectional sources of oppression they face in their daily lives. Because youth aren’t just the future – they’re actually the now. As you move forward reflecting on (and dismantling!) everyday adultism, check out some of the work currently being done by youth. Learn from youth directly about the visions they hold, and humbly join in their march. Know any other social change movements spearheaded by youth power? Share with us! Kel Kray is a Contributing Writer for Everyday Feminism. Kel is a fiercely friendly social justice warrior who spends their days advocating with and on behalf of queer youth at an LGBTQIA+ youth center in Philly. A firm believer in the transformative power of dialogue, Kel coordinates a youth-driven education and training program that facilitates community workshops on gender and sexuality with an intersectional lens. Read Kel’s articles here.